The region has strong examples of scaled micro hydro programs for rural development -- in Indonesia, Nepal and Sri Lanka. With the help of HPNET members from these contexts, the network has developed practice-to-policy fact sheets for a closer look at how long-term capacity building and appropriate financing can lead to well-established, local industry for micro hydropower. HPNET's approach to knowledge exchange involves post-exchange advocacy products and strategy-building, involving multi-actors. Please contact us for more information. Among the strengths of HPNET are members who have established training and/or fabrication centers for micro hydro technology dissemination. HPNET is facilitating partnership among these centers and advocacy to leverage their expertise. 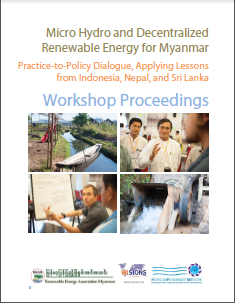 In February 2015, HYCOM co-hosted HPNET's 2nd Annual Gathering of Micro Hydro Practitioners. HPNET members continue to learn much the facility, offering various micro hydro demonstration units for operator training and overall implementation training. In November 2016, NMHDA co-hosted HPNET's 3rd Annual Gathering of Micro Hydro Practitioners, during which NMHDA inaugurated its training center near Kathmandu, featuring a grid interconnected micro hydro system -- a new addition to NMHDA's long history of local capacity building work. In August 2013, Tonibung co-hosted HPNET's 1st Annual Gathering of Micro Hydro Practitioners at CREATE, a local knowledge and training center established for local capacity building. SIBAT leads the community-based renewable energy systems (CBRES) network in the Philippines and has recently established the CREATech training center for local fabrication of micro hydro turbines, which will co-host HPNET's 4th Annual Gathering of Micro Hydro Practitioners in June 2019!